Sometime when I was in high school my father came home with an oddly shaped cut of meat. Long thin and narrow, the boneless cut was unlike anything I had ever seen before. "What's that?" my mother asked. "It's called flank steak," my father said. "The guy at the store said to marinate it in soy sauce and broil it for a few minutes on each side. It's cheaper than skirt steak so I thought I'd give it a try." We were skeptical, but he marinated the meat overnight in the soy sauce. The next night at dinner time he turned on the broiler, put the meat in the broiler pan, and let it cook for a few minutes on each side. It was a tough job for him - every one of us in the family had different tastes in how done they liked their meat, ranging from still moving to shoe leather. We all watched with some skepticism as he put the meat on the cutting board and sliced into it. He sliced against the grain and the meat piled up on the plate. It looked pretty good. And tasted even better. In those days the only use we had for soy sauce was when my mother made "pepper steak", an extremely Americanized version of the already Americanized entree we always ordered at the one Chinese restaurant in downtown Houston. 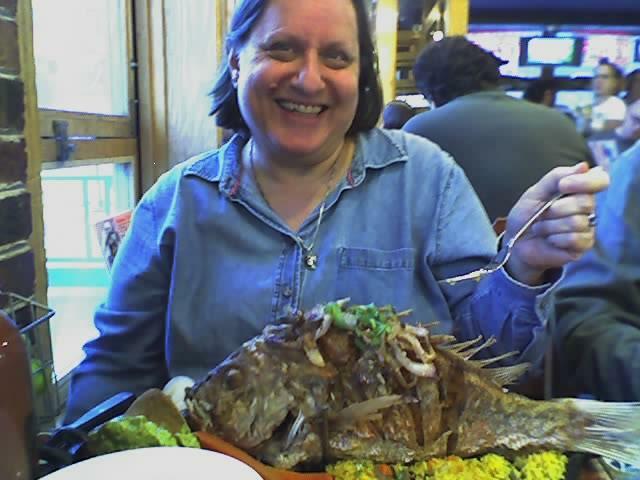 For starters, she used a Dutch Oven over a low flame and cooked it for a long time. It was more steamed than stir-fried. What made it Chinese were the La Choy Chow Mein Noodles we lavishly sprinkled over the top (actually, my second favorite part) and the soy sauce with which we seasoned it, and my absolute favorite Chinese ingredient during my childhood - water chestnuts. But before I wander all along my childhood memories of all things La Choy, let me get back to flank steak. The soy sauce made for a most excellent marinade. In fact, over the years we pretty much marinated everything in it - it works especially well with chicken and celery, and for a while during my college years one of my signature dishes was chicken baked in soy sauce with onions and pineapple. Ok ok, back to flank steak. 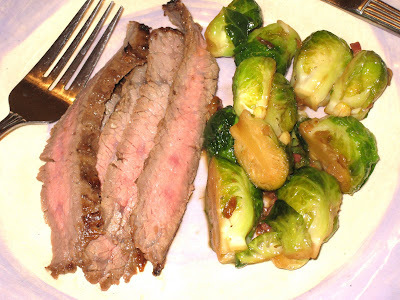 Soy sauce marinated flank steak became a part of the regular dinner rotation in our house. After a while, I couldn't imagine it prepared any other way. I would see recipes that called for different marinades and different cooking methods, but I never ventured past our old tried-and-true version. One of those "if it ain't broke don't fix it" kind of things. So I don't know what got into me this time. I had the flank steak. I had the soy sauce. But I also had a lot of other things in the pantry and the fridge. I got fancy with it, and I am so glad I did. And here's how you can too. 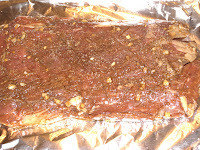 Flank steak is a lean cut, so it needs a little added moisture. That's why it is a good idea to put it in a marinade and leave it in the refrigerator overnight. Put the ingredients into a sealable plastic bag. Add the steak, making sure it is well coated with the marinade. Seal the bag, place it on a plate or in an empty dish to catch anything if it leaks, and place it in the refrigerator for at least a couple of hours, preferably overnight. 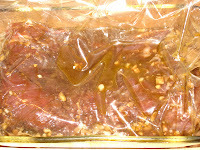 Take it out every once in a while and turn it to make sure that all of the meat has its turn in the marinade. Take the steak out of the refrigerator at least 15-30 minutes before you plan to cook it. Take it out of the bag and shake off any excess marinade. If you don't have a broiler pan (I don't), line a cookie sheet (one that has sides) or some other shallow oven-proof dish with foil. Place the steak on the foil and let it come to room temperature. About 5 minutes before you're ready to cook it, turn on your broiler. Just before you are ready to cook it, season it with salt and pepper. Put the steak in the broiler. Be sure to leave the broiler door open a little so the hot air can escape. 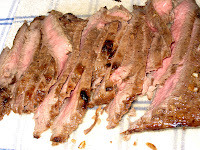 Flank steak, like other lean meats, stays more tender and has more flavor the less it is cooked. For rare steak, cook it about 3 minutes per side. Be sure to season the other side before you put it back into the oven. For medium rare (which is what I did here), you want to cook it about 4 minutes per side. It cooks pretty quickly, so even if you want it done I wouldn't cook it for more than five minutes per side. If you want it really well done, you might want to cook a different cut of steak for your dinner. 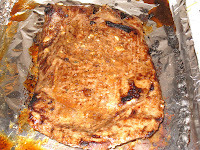 After you take the meat out of the oven, let it sit for 15 minutes, so the juices can redistribute evenly. This would be a good time to make your salad and put the finishing touches on your side dishes. Take a sharp knife and cut the meat into thin slices. As you can see from the bottom part of the uncut steak, I should have honed my knife before I started cutting. Be sure to cut the meat against the grain. If you cut the meat with the grain on a long-grained cut like flank steak, it is tough and stringy. Cutting against the grain helps keep it tender. And that's it. Nothing could be simpler. And as delicious as it is the night you cook it, it tastes even better the next day, if there's any left. That looks amazing! Must make it! Yes you must, Lynda. Really easy and super delicious. The brussels sprouts were really good, too. More about that in a future post.